Surprise! Click here to play! This game is not about sevens at all! Rather it will see you gathering fruit for a chance to cash in some major winnings! Well … there is one seven that you’ll need to watch out for. It’s the 7 wild symbol that will replace all other symbols (except scatters and bonuses) to create more winning combinations on the board to result in even more money for you! That exception aside, you main aim is to gather the fruit. Spin two to five bananas and you could win up to 8000 credits. Two to five pears will get you up to 2000 credits, and grapes will get you up to 1000 credits. There are also lemons, apples, oranges, cherries and plums on the board for you to collect. All of them will pay off handsomely with the lemons brining in up to 400 credits and the plums bringing in up to 80. There is also a carafe that acts as a scatter symbol. Spin three to five of these on the board and you will be rewarded up to 20 free spins. The golden bell acts as a bonus symbol and will trigger a feature if it appears on selected lines. This game is also available in a 3 reel version. 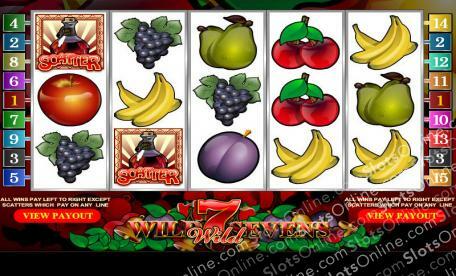 Take a few spins on either Wild Sevens slot to gather fruit and bring home the big bucks! The carafe full of juice is a scatter symbol. Spin three or more of these and you will be rewarded with up to 20 free spins. The 7 symbol acts as a substitute. It will replace all other symbols except scatters and bonuses to create more winning combinations. The golden bell is a bonus symbol. If you spin this symbol across reels 1, 3 and 5 in a pay line and you will be rewarded with a bonus sum of credits.